Congratulations, voters. Your newly victorious Republicans are already starting to deliver to you. That is, if unparalleled obstructionism and inertia is what you expected. One of the first measures to be killed in Congress's lame duck session is the so-called New Start treaty which would force the United States and Russia to pare back their nuclear stockpiles and resume mutual inspections; inspections that took place every year since the Cold War except last year. Sounds like a good thing, right? 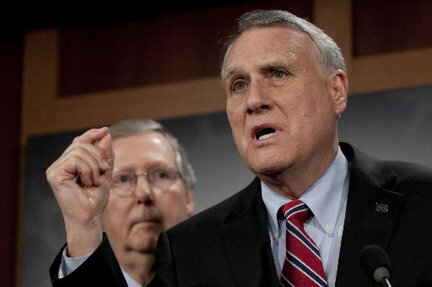 Well, not to Sen. John Kyl (AZ), the GOP's point man on the issue. That New Start is President Obama's top foreign policy goal clearly makes it The Party of No's top priority to defeat it. Nice of Kyl to put partisan politics before the nation's safety. Imagine if it were Democrats blocking this bill. Imagine the incendiary rhetoric and fear mongering that would follow. Imagine the chorus of, "Democrats cow-tow to Russia and allow them to out-Nuke us!" We'd hear how the "Socialist Obama regime empowers its communist ally!" The Republican spin machine would be operating in overdrive spitting out the message and talking points about how "Americans are threatened by Obama's inability to protect the U.S. from Nuclear attack!" So why is that Kyl and his Nattering Naybobs of Negativity will be given a free pass on this? It's because Democrats are spineless. It's because the left lacks a potent spin machine. It's because the much hyped "liberal media" is in truth nothing more than Keith Olbermann and his one million viewers. When it comes to defining the issues and, more importantly its opponents, the Democratic Party is simply neutered. Nuclear proliferation is a very serious issue. It impacts the war in Afghanistan, the threat from Iran and the risks to America posed by terrorists. But apparently it's not as important to Kyl as helping Sen. Mitch McConnell make sure Obama is not re-elected in 2012. You bet. They are hoping to run out the clock until 2012. They believe that the voters are doing what they want. Well since our side didn't vote, I guess they are somewhat right. All is not lost if the Dems and Obama get some balls. I support our president, but when are they going to play hardball? The Voters Have Spoken...or Have They?